The City of Angels, an unsuspecting recipient of environmental accolades. This weekend I was forced to bathe in a tub of ice cubes and cucumber slices to escape the hellish, sticky heat blanketing New York City. To pass the time, I leafed through a recent copy of The Economist and an article about a report from the Brookings Institution caught my eye. The report declares that New Yorkers hold fourth place for the lowest carbon footprint in America, per capita, trailing residents of Honolulu, Los Angeles and Portland. Now, wait a minute—what’s Los Angeles doing on that list? Growing up in Southern California, I used to drive up to Griffith Park to gaze down upon the metropolis. It was invariably stifled by a layer of grayish-brown smog, and I could see the culprits responsible for a good part of the gloom–cars stuck in gridlock on the vast concrete byways cutting across the sprawl. But New York City, the land of subways, buses and feet, is America’s great paean to car-free living. 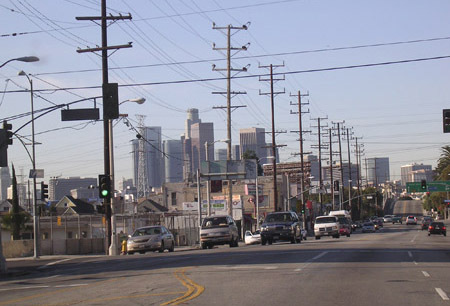 So how did Los Angeles manage to beat New York City to a lower carbon footprint? Simple. Southern California’s weather is much better, all year round. To be fair, there are a few other reasons for Los Angelenos’ low carbon footprints (tighter sprawl is one). The report has also been criticized for disregarding the emissions impact of local traffic, relying instead on household and highway emissions data. Nevertheless, mild weather seems to go a long way in explaining why Brookings’ top ten is dominated by seven cities whose residents can dip their toes in the Pacific. For those of us in more unfortunate climes, polluting less requires more conscious efforts, such as pulling the plug on the A/C in the summer and piling on the bearskin rugs in lieu of heating in the winter. This carbon contest just ain’t fair. Environmentally savvy cabs driving the streets of New York City. Some flower bouquets are more eco-friendly than others.